← St Louis Ribs, Dr Pepper BBQ Mop, the Best! shellfish, and so on. You may in fact be surprised at how easy this sauce is, and how impressive the results are. This is my version of a basic red spaghetti sauce (differing from ‘gravy’ or traditional red sauce, which cooks over night with all kinds of meats). The flavor of basil is strong and sweet. By itself, it can become abrasive and ‘herby’, and has the potential to destroy your meal. Used properly, with the proper ingredients, it’s perfect. Tomato (ESPECIALLY san marzano) and sweet basil with good quality olive oil is a match made in heaven, so why not capitalize? Those are the simple flavors we need. Pared together, they speak for themselves. Otherwise, I don’t have too much else to say about the recipe. Marinara sauce is what it is, and this is my favorite recipe. It’s sweet, full of flavor, and serves its purpose. 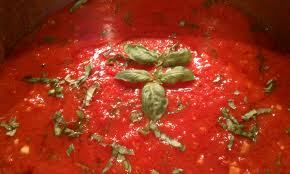 In a medium sized heavy bottom sauce pot, begin heating 1 tbsp olive oil. Add the onion, carrot and celery and cook until translucent and very fragrant. Add the garlic, pepper flakes and a little salt and pepper. Continue cooking until you can smell the garlic (it should smell sweet). Add the white wine and tomatoes at the same time. Add the dry basil, oregano, sugar and cinnamon. Re-season with a small pinch of salt. Bring to a simmer and stir to ensure everything is well combines. Add the rest of the olive oil, basil and chicken stock. Simmer slowly for about 10 minutes. Check the seasoning and make sure you’re happy with it. Transfer the sauce to a bar blender and run until very smooth. Your sauce is now ready. Use right away, or ‘customize’ it for whatever you’re preparing. For shellfish, maybe add a little caramelized fennel and additional pepper flakes. You may want to simmer it with meatballs for incredible spaghetti and meatballs. Whatever you choose to do, your foundation sauce will be excellent.